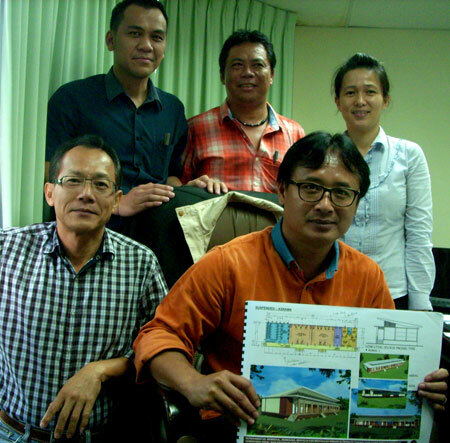 FIGHTING AGAINST TIME: Alexander (seated left) and his team showing the artist’s impression of the dormitories that the company will be building for SK Punan Ba. 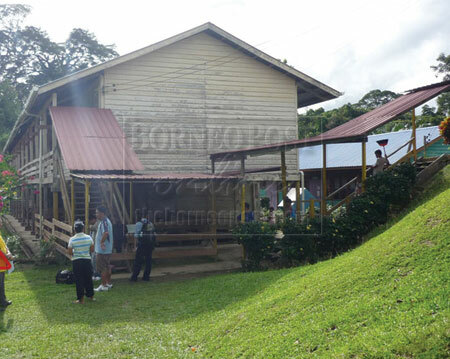 KUCHING: To meet the deadline of building the two dormitories for Punan Ba primary school in the upper reaches of the Rejang River in Belaga district by March the contractor, Irok Industries Sdn Bhd, will use helicopters to transport prefabricated building slabs to the site. The company was only awarded the contract last month and the only way to complete the project in such a short time at this remote Penan settlement is to use pre-fabricated lightweight concrete panels. The panels are fabricated at a factory in Peninsular Malaysia, based on plans approved by the Education Department, and would to be transported to the site to be assembled. Set for replacement: The hostel whose verandah collapsed in January last year. However, using barges up the mighty Rejang River or roads from Bintulu would take too long for the hostels to be built by March, thus forcing the company to charter helicopters used for logging in Sabah as the only viable alternative. “We have to use helicopters to transport the materials, otherwise we would not be able to complete the project in time,” Irok Industries general manager Alexander Asing Sadai told The Borneo Post at his office here yesterday. The pupils at Punan Ba had been squatting at the quarters of the headmaster and teacher since their hostels were abandoned last January after the verandah of the girls’ dormitory collapsed and injured several of them. A picture of the pupils sleeping like ‘packed sardines’ taken by one of their parents and published on the front page of The Borneo Post early last month tugged at the heart strings of readers and sparked a public outcry. This apparently led to the swift award of the contract to build the hostels within three months. The company has placed the project as a top priority and is channeling all its resources to meet the deadline. “We see it as top priority not only because it has become a national issue after it was highlighted by The Borneo Post but also because the students really need a place to stay and not be packed like sardines. Our men are already on the ground preparing the site,” Alexander added. He explained that using light weight concrete pre-fabricated slabs would cut down construction time by one third as compared to using conventional building materials. Alexander said he was aware that there had been reports of defects in buildings using light weight concrete pre-fabricated buildings panels in the state and in Sabah, but he assured that the system and materials his company was using had been proven to be reliable and suitable for local condition. “There will be a defect liability period of two years, and we will take responsibility for the buildings. “We believe that the ones we are building will last at least 20 to 25 years, assuming that the buildings are well taken care of … which is not too far from conventional buildings,” he said.